This really is the best grilled chicken marinade ever. Inspired from the famous Sanpete County’s recipe, this chicken comes out super moist and flavorful every time. Pair it with some grilled veggies or Piccadilly Chips and you have an amazing and easy dinner! Hello friends, Zach here. It’s Man Monday Time! 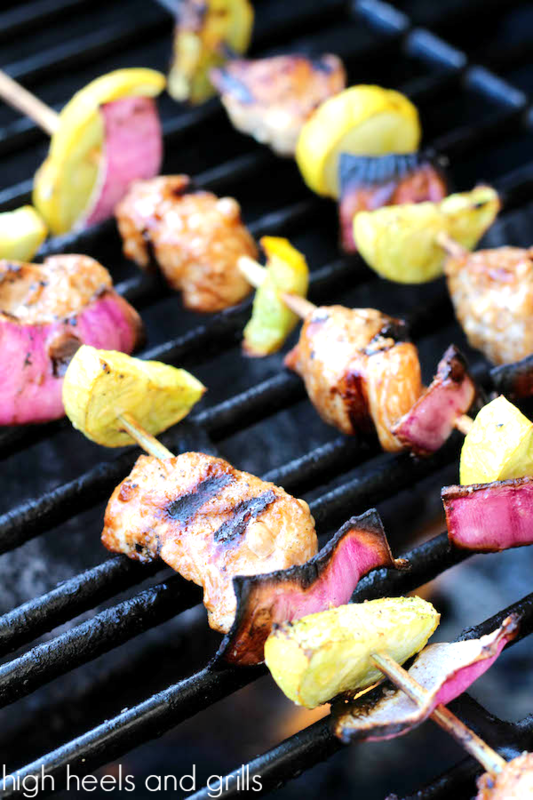 This recipe for The Best Grilled Chicken Marinade Ever actually comes from Sarah’s hometown, but I’m going to be the one to tell you about it today, because I love it just as much as she does and – well, it’s a manly recipe. Back when Sarah and I were dating (5 years ago this month, BTW), I made frequent trips back and forth between Logan, UT (where I was living) and tiny little Ephraim, UT (where Sarah was living). On one of those occasions, I happened to be in Ephraim during the oh, so beloved Scandinavian Days. What is Scandinavian Days, you ask? It’s a three day event, held over Memorial Day weekend, to celebrate the establishment of Ephraim, which is just fancy words for lots of booths selling all kinds of crap, live music, tons of food, but most importantly – Sanpete BBQ Turkey and Piccadilly Chips. You may or may not know this, but Sanpete County is Utah’s turkey-growing capital, which means that you can’t have a real Sanpete event without their famous BBQ Turkey being present. Rightly so too, because it’s amazing. It’s so flavorful and moist and it has a way of telling you that summer is officially here. We substituted chicken breast in this recipe for the cost and convenience factor. We don’t live near a turkey plant here in Colorado, like they do in Sanpete County, (thank goodness too, because those turkeys stink!) so we had to make do. Normally, you also eat them as turkey steaks, but we prefer them in kabob style. We made these at least a dozen times last summer and they were a hit every time. We even made them for Addi’s birthday party and we often make them for company. Heck, I even make them when I go over to OTHER people’s homes. True story. The time is ripe my friends to spread the word about these delicious kabobs.You know what else is great? You marinade these suckers in soda. As if you haven’t had enough of cooking with soda lately. 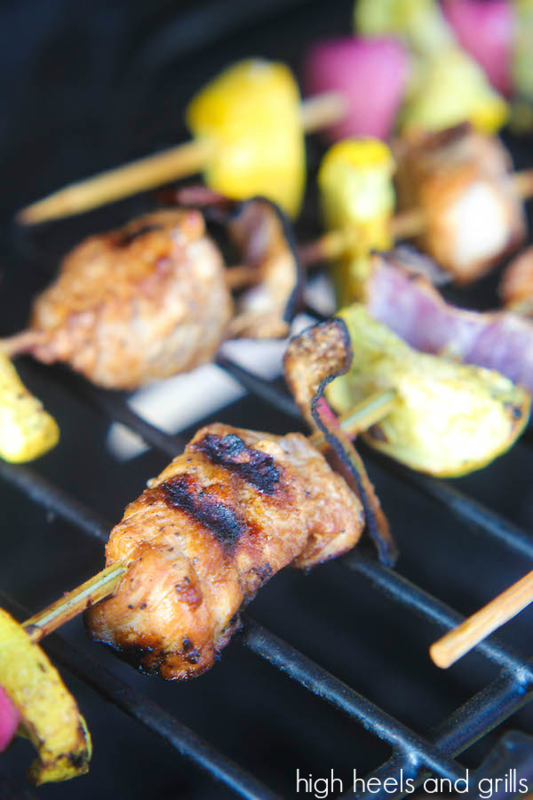 This grilled chicken marinade comes from good ol' Sanpete County, Utah and is the best marinade recipe you will ever find. The chicken comes out super moist and flavorful every time. Pair it with some grilled veggies and you have an amazing and easy dinner! 3 lbs. boneless skinless chicken breast, cut into 1&1/2 inch pieces. Place all of the ingredients except for the vegetables in a medium bowl or large Ziploc bag and stir to combine. Place bowl or bag in the refrigerator and let sit for 1 hour. 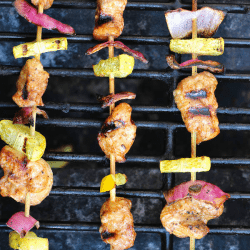 Soak skewers in vegetable oil or spray down with non-stick cooking spray. 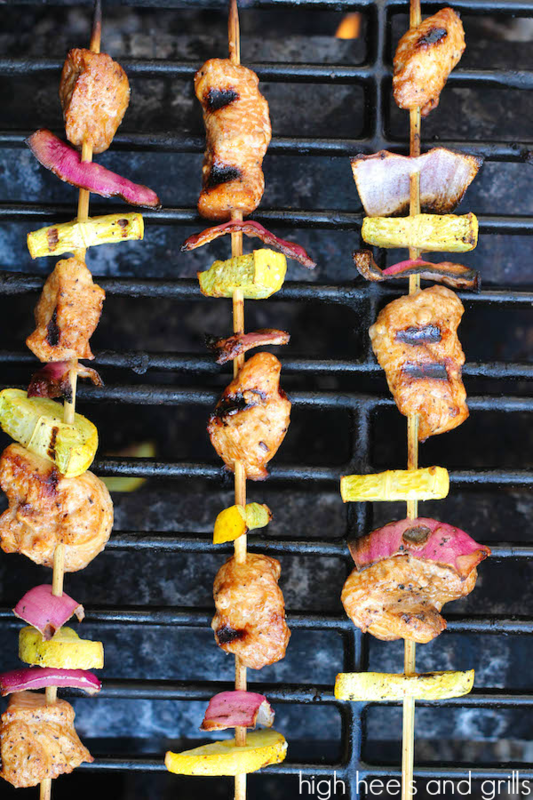 Thread the chicken pieces onto the skewers, alternating with veggies. Salt and pepper your veggies. Place kabobs on grill and let cook for 10 minutes, flipping halfway through. Grill on, my friends. Grill on. Grilled chicken is probably my favorite summer time meal of all!! This sounds like the perfect marinade, can’t wait to try it! This is happening this weekend- I have the chicken thighs needing some basting! sprite…who knew, but it sure sounds good! Wow, secret weapon of Sprite in your marinade. I’ve never tried it, but will!